Pain in the legs is a common symptom and most of the time it is not serious. Often leg pain is related to strain, after standing, walking or running for long periods. The pain in these cases usually arises from the leg muscles and the tendons which connect the muscles to the bones. However, sometimes the pain may be related to the blood vessels of the legs or even the bone. Although there are not as many structures in the legs as there are in other parts of the body, pain at a certain spot in the leg may be due to specific causes and conditions. We often refer to the lower limb as the leg. This is technically incorrect. The lower limb is made up of three parts – the thigh, the leg and the foot. Whenever assessing pain, it is important to first consider what organs or structures are located in the area. 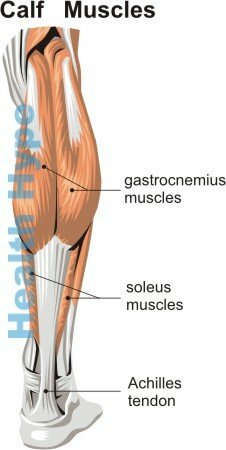 Most of us think of the calf muscles and shin when we look at the lower leg. The calf muscles are more prominent on the upper back part of the leg but its tendons run all the way down to the heel. The bone that we feel at the front of the leg is the tibia, which is also known as the shin bone. However, the calf muscles and shin bone are not the only structures in the lower leg. The are various causes of lower leg pain but pain below the calf specifically refers to the back of the leg just above the heel. Problems with the superficial areas of the skin may cause evident bruising, swelling or skin rash along with the pain. However, problems deeper in the leg may only present with pain without other symptoms being obvious. Any injury to the lower leg will result in pain. This may be blunt force injuries or penetrating injuries, and includes surgery to the area. A blow to the lower part of the leg may occur during contact sports, falls or other accidental mishaps. Sometimes it may be intentional as is the case in an assault. Depending on the nature of the trauma, the injury may only be superficial involving the skin and outer lying tissue beneath the skin. Sometimes it can be deep and extensive involving the tendons, muscles, nerves, blood vessels and bone. Chemical trauma to the area can also result in pain. A number of different infections can affect the lower limb as it can involve any other part of the body. However, the lower leg is often more prone to infectious conditions like cellulitis. This is an infections of the tissue under the skin. It is more likely to occur when there is a break in the skin with bacteria entering the subcutaneous tissue. Cellulitis can be serious and even life-threatening if not treated promptly. Similarly deeper lying infections can also be serious. Other parts of the leg that are likely to become infected include the blood vessels, particularly the veins. The bone may also become infected which is a serious condition. Strain to the muscles and tendons are common causes of pain below the calf. These muscles and tendons have to stabilize the body while standing, walking or running. Inflammation arises with strain but with extreme activity there may even be a muscle tear or tendon rupture. Strain is more likely to occur with excessive/prolonged standing, walking or running, beyond what the muscles and tendons are conditioned to handle. Tendonitis in this area is common. One type of tendonitis that is likely to cause pain at the back of the leg below the calf muscles is Achille’s tendonitis. A sprain is the common term for excessive stretching of a ligament. This is common in the lower leg. An ankle sprain occurs when there is a sudden twisting of the foot at the ankle joint. The ligaments that stabilize the ankle joint are abnormally stretched. Sprains are common and often heal on its own within a few days. In these cases the ligament is stretched but not torn. However, a more severe strain can result in a partial ligament tear. In the most severe instance, a ligament can tear completely. It is very painful with severe swelling and bruising. Bone pain may occur for many different reasons. Trauma (injury) is one possible cause of bone pain and if severe it can even result in a broken bone (fracture). Another possible cause is a bone infection which is known as osteomyelitis. There is also the possibility of a bone tumor which may cause pain. This can arise from the bone tissue or in the case of cancer it can spread from another site to the bone. There are a number of blood vessel problems that can affect the leg and cause pain below the calf in the lower leg. Two of these blood vessel problems involve a narrowing and a blood clot. Peripheral arterial disease is where the artery to the leg is narrowed. During physical activity there is pain in the leg, particularly in the calf and below. The other blood vessel problem that cause pain below the calf is deep vein thrombosis (DVT). This is where a blood clot in the deep vein on the leg blocks blood flow back to the torso. There is a risk of the blood clot dislodging and traveling to the lungs where it can cause a potential fatal complication known as a pulmonary embolism. Nerve pain (neuralgia) may occur if the leg nerves are irritated, injured or diseased which is known as peripheral neuropathy. One type of nerve problem is where there is pressure on the nerve. Compression may occur at the nerve root where it emanates from the lower back or anywhere along the course of the nerve. Another nerve problem that may cause pain in the lower leg is diabetic neuropathy. This is nerve damage that occurs with long term diabetes mellitus, particularly where the diabetes is uncontrolled. There may be pain and burning in the early stages but if the nerve is extensively damaged then there is a loss of sensation (numbness).